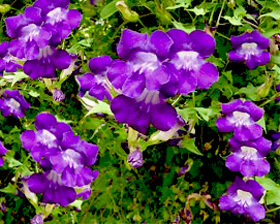 Asarina or Climbing Snapdragon is a spectacular vine, which produces attractive lime green leaves and masses of stunning, violet colored, trumpet-shaped flowers from summer until frost season begins. Asarina flowers usually appear within 3 months after starting the flower seed. Climbing Snapdragon requires a moist, well-drained site in full sun to partial shade. In cold climates, the plants will die down in winter, but will often re-shoot the following spring. In addition to climbing, this vine is an excellent choice to grow as a ground cover, in a hanging basket or for covering fences and trellises. Climbs to 120-240cm. The Climbing Snapdragon seeds can be started directly outside but have a structure ready for it to climb. Sow from early February to mid April in a good seed compost just covering the seed with a thin layer of compost or vermiculite. Germination takes 14-21 days at 20-24C. Seal in a polythene bag after sowing and don't exclude light.